Phew – the posts are coming thick and fast, but I knew I’d be leaving you all on a cliffhanger if I didn’t blog about the final result! In the last two posts I talked about making my gran’s 80th birthday cake, and making the passion fruit curd to fill it with. In this post, I’ll show you how to (really easily) make the buttercream icing and put it all together. The only ingredients at this stage are for the icing and decoration, and there are only three of them! Make sure the butter is soft and use a hand mixer to blend it a bit in a big bowl. You might find it easier to do this icing half at a time, as moving this much butter around is tough on the old arms! Once the softened butter is mushed a bit, add the icing sugar a little at a time, using the beaters to mix it into the butter after each addition. Don’t be tempted to put it all in at once, you’ll create an icing sugar cloud, sneeze a lot and make a very big mess. When all the icing sugar is mixed in, beat until completely smooth and soft. That’s it! You can add a splash of vanilla essence, a hit of lemon zest or anything else that takes your fancy, but this is the basic ratio of butter/sugar for buttercream icing. Cut each cake horizontally through the middle (its easiest with a serrated knife) and spread a thick layer of the passion fruit curd over the bottom layer of each cake. Then spread a layer of buttercream over the curd. It doesn’t matter if they mix a little bit, it’s going to be covered. Put the top of the cakes back on their bases. The larger cake will be your bottom layer. Its easier to pop it on your serving plate/stand before you start icing the exterior, so do that now. I also placed the bottom cake upside down, so that I had a very flat surface to place the next cake onto. It doesn’t matter if the base is a little wonky as you can hide that with icing, although it shouldn’t be too bad if you flattened the top as suggested in part one. Buttercream the top of the bigger cake and then place the sandwiched smaller cake on top. Try and get it central. Now buttercream the top of the smaller cake, then go round the sides of both cakes, making sure they are completely covered. TIP: If the butter wasn’t quite soft enough and you’re still finding the buttercream a bit hard (this can make it tricky when doing the sides) add a tiny splash of boiling water and beat into the mixture. That will soften it nicely but will allow it to harden again when it cools. Make sure you fill in any gaps between the two cakes, and any gaps at the bottom. A good idea is to use palette knife once the whole cake is covered. Dip it in hot water and then run it along the sides to create smooth edged and a smooth top. To finish it off, melt the white chocolate in the microwave, or over a pan of simmering water if you prefer. While this is melting, get a sheet of baking paper, and place on a tray. Once the chocolate is melted, pour into a piping bag with a pinpoint round nozzle – the sort you’d use for writing letters. Decide on a shape and then pipe outlines onto the baking paper, followed by some patterns inside the shape to connect all the edges (for stability). I went for tall triangles and filled the insides with zigzags. Pop the tray into the fridge until the chocolate has set. The pieces will then come away from the paper really easily. How you use them is up to you. 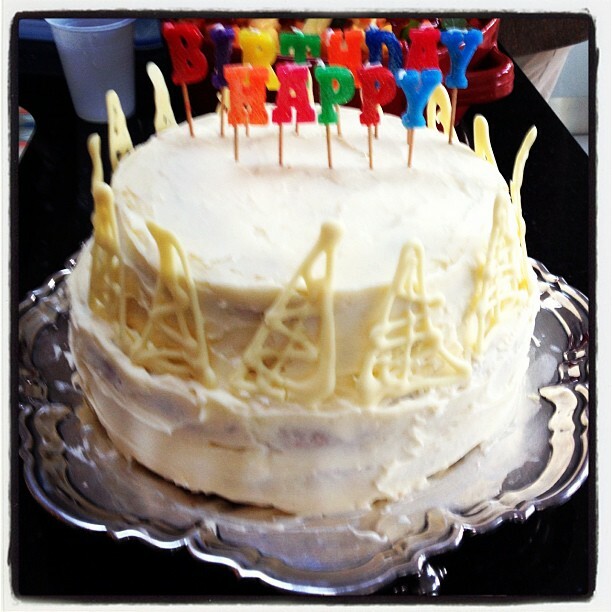 I used my tall shapes to stand on the lip between the two cake layers, but they’d also look great forming a sort of teepee on top if you didn’t have candles. Ta Da! The finished article. Photographed in a slight blur as I had to capture a quick snap before we lit the candles. So there you have it. Quite simple really, but very effective. Other ideas could include using milk chocolate for the decorations as a contrast, different colours of icing for each layer or even ombre icing if you were feeling really adventurous! If you are looking to feed a crowd this is a great cake. By the time we served it everyone (40 plus people) had eaten a lot of food, so we cut it into small squares, like you’d get at a wedding. It probably would have fed twice as many people and several people went home with a chunk! This can also be iced the day before, covered in clingfilm and left somewhere cool. So if you have a big party to plan, you can get this done ahead. There will now be a short break for the baking bandit. Quite a lot to do in the next few weeks. But its my dad’s birthday at the end of the month and we’re having another party, so I’m sure there will be another cake. Most importantly – a good wedding cake? I am just looking for something small and white to cut, and some of our friends will hopefully provide a few extra cakes so that we can feed everyone. Good evening my fellow bakers! Autumn has more definitely arrived here in Edinburgh, although we’ve been lucky enough to have some glorious autumn sun the last few days – long may it last! At least autumn heralds the return of comfort food – and baking! 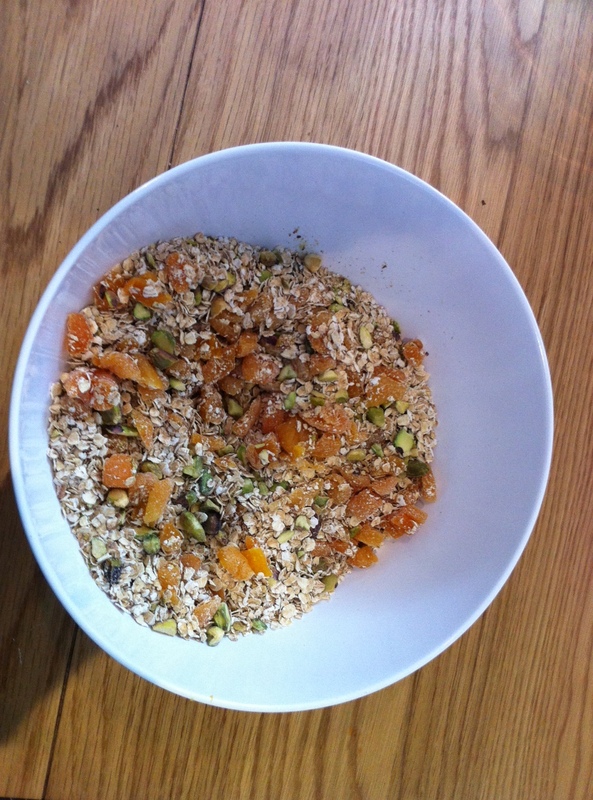 You will need: 140g unsalted butter, 120g soft brown sugar, 3tbsp of golden syrup (or honey if you prefer), 175g porridge oats, 75g pistachios (shelled and unsalted), 140g dried apricots chopped into little pieces, packet of white chocolate drops (from the baking section of the supermarket – you can use buttons or half a bar of white chocolate if that’s easier). Start by melting the butter, sugar and golden syrup in a pan. Keep the heat low and make sure that the sugar is totally disolved. Don’t let it start bubbling or you’ll end up with a very sticky pan! While that’s going on, chop up the nuts and mix with all the other ingredients in a heatproof bowl. It looks lovely even like this! Doesn’t it look healthy and pretty?! This is before all the butter and sugar…. Once the mixture in the pan is completely melted, let is cool a little, then pour into the bowl with the dry ingredients. It’ll be very stiff, but make sure it’s all mixed in properly. 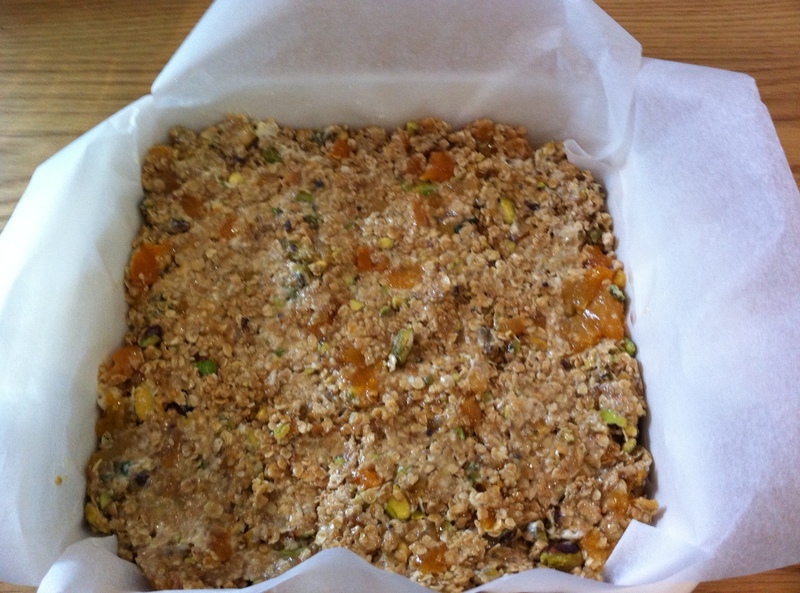 Then spoon into a lined 20x20cm tin, and flatten with the back of a spoon. Pop in the oven at 140/160 degrees for 35 minutes. When you take it out the oven it will be runny, so don’t try and take it out the tin. Leave it to cool completely, then remove from the tin and cut into pieces. I went for nine good-sized portions. Make sure its cold before removing from the tin, or you’ll have a very sloppy mess! It hardens quite quickly. Line the tin well so that you’re not scrubbing burnt sugar off your pans – who wants to be doing that?! These are quite sweet, and would be just as nice without the white chocolate if you prefer something less tooth-decay inducing! If you leave out the chocolate, up the sugar a little bit to 140g. 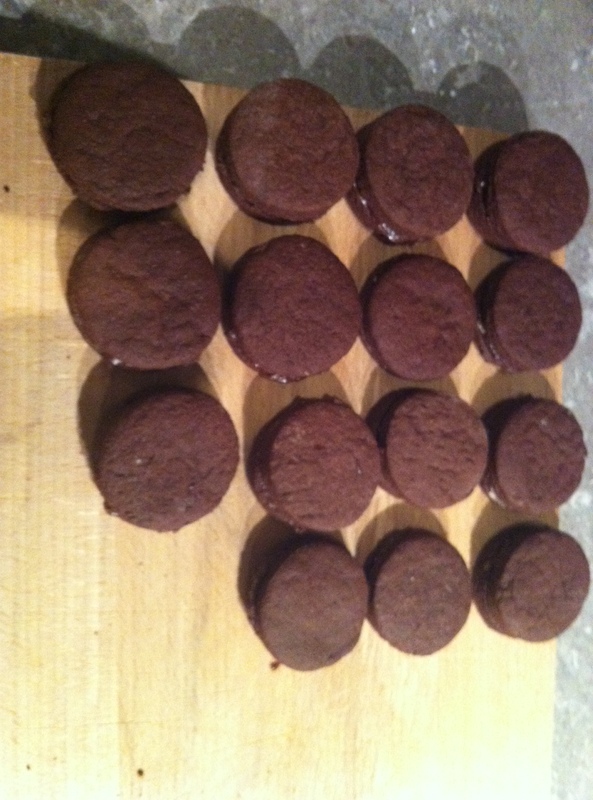 I also made some bourbon biscuits (so much better than shop bought!) which would be equally good for an energy boosting snack on the move. Don’t they look scrummy? Chocolate buttercream filled bourbon biscuits. Delicious! My next baking experiment will be a biggy – its my grandma’s 80th birthday and I’m making the birthday cake! I feel I better do a test run, so I’m going to use it as an excuse to make a scaled-down version of the lemon wedding cake I want to use. Two birds…one stone… you get the idea! So cross your spoons and wish me luck!